Colors: matt black, glossy black, brilliant white. It replaces the original front face of your t-max 530. Reference bcd matt black: faceavant019 22 reference bcd glossy black: faceavant019 02 reference bcd white faceavant019 01. New, sold in original packaging. In stock - shipping within 24 hours. 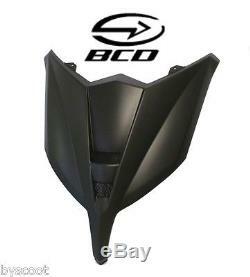 The item "bcd front panel for yamaha t-max 530 ii tmax phase 2 new 2015 2016 front cover" is on sale since Thursday, October 29, 2015. It is in the category "auto, motorcycle parts, accessories \ equipment, tools" Garage \ others.
" The seller is "motodak" and is located in essigny le petit. This item can be delivered anywhere in the world.